More than 100 chiropractic doctors in North America are being sent by Florida-based Maximized Living (ML) to the 2012 Olympics. They have been chosen to help members of USA judo, weightlifting, wrestling and sitting volleyball win a medal. This is the first time that a large group of chiropractic doctors have traveled with Olympic bodies to represent the US at the games. It is also the largest contingent of chiropractic doctors to have been selected to support and care for American athletes in London. The ML Sports Council has worked closely with many national governing bodies to bring a holistic, whole-athlete approach to health that includess chiropractic principles, balanced nutrition, mental preparedness and fitness programs focused on building strength, endurance and enhanced performance. Dr. Ben Lerner, a former all-American wrestler and founder of Maximized Living, has bridged a gap in performance management by creating the first and largest certified network of chiropractic doctors trained in whole-athlete care. ML Sports Council chiropractic doctors are certified not only in advanced chiropractic techniques but also in nutrition, detoxification, exercise and mental preparedness. Jose Rodriguez, USA Judo Executive Director, commented, "This is about making our athletes stronger, faster and sustainably successful. Our partnership with ML has given us the education, support and comprehensive principles to increase stamina, strength and perform at their pinnacle in London." Terry Steiner, 2012 USA Women's National Coach commented, "I have seen a tremendous value in our partnership as it pertains to the performances of our Olympic team. I can further see the positive, life-long effects these doctors can have on their lives after London." "We're proud of the selfless commitment our Sports Council doctors have made in helping USA's elite compete at the highest level, achieve peak performance, recover faster, sustain fewer injuries and reach for the gold. Our Sports Council's success is a testament to the performance and recuperative aspects of chiropractic and the critical role Maximized Living doctors play in helping to unlock the full human potential," commented ML CEO, Shel Hart. 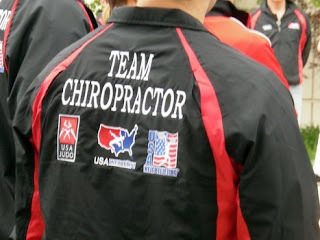 Chiropractic doctors are not only being utilized by athletes at the 2012 Olympics but also by the 2010 Major League Soccer World Champions, Colorado Rapids, US Martial Arts, the International Brazilian Jujitsu Federation, many top MMA teams, and hundreds of athletes and teams at all levels and all over the world. I have been looking the World Wide Web for this information article Chiropractor Joondalupand I want to thank you for this post. It’s not easy to find such perfectly written information on this topic. Great Work! I agree chiropractic care is essential for Olympic athletes. It can increase their body strength and balance because both of these are essential to take part in Olympic.